Facebook CEO Mark Zuckerberg’s call for Internet regulation may be a turning point in Internet governance. In a blog post called “Four Ideas to Regulate the Internet,” the Facebook chief holds up a white flag of surrender regarding self-regulation of its own platform. It wants governments to come in to take over the burden and shield it from the intense pressure and controversies surrounding social media. What makes this interesting is that many progressives and human rights advocates have also been calling for regulation of platforms. This is especially true in Europe, where the word “regulation” seems to mean a neutral, omniscient, practically divine external force, free of all self-interest or political influence, coming from the sky to correct any and all societal failures; there is an almost childlike belief in the ability of state intervention to make things better. Now these people are about to be schooled in the realities of regulation; it will be one of those “be careful what you ask for” moments. Content regulation. Zuckerberg doesn’t want to have so much “power over speech,” so he wants regulation to “set baselines for what’s prohibited and require companies to build systems for keeping harmful content to a bare minimum.” There is no mention of the value of free and unsuppressed expression to be found. Protecting elections. Zuckerberg wants regulation to create “common standards for verifying political actors.” He says existing political advertising laws “primarily focus on candidates and elections, rather than divisive political issues where we’ve seen more attempted interference.” So, he envisions a dangerous broadening of political speech regulation to any messages about issues and controversies that might be considered political. Privacy and data protection. Zuckerberg calls for a “a globally harmonized framework” and holds up the GDPR as a model. This is one of his less objectionable ideas, but it is also a bit odd. The GDPR already exists so it is not a new “regulation of the Internet,” and Facebook’s legal department is doing everything it can to slow down and minimize the application of GDPR to domain name Whois. Data portability. This is a sensible and potentially pro-competitive suggestion; however, it sounds more like a form of standardization that could be and probably already is being taken care of in the market than a new form of regulation. And since the main obstacle to competing platforms is not so much the ability to move old data but the ability to share new information with other users on the same platform, it’s not clear that data portability would slay the network externalities that maintain Facebook’s dominance. 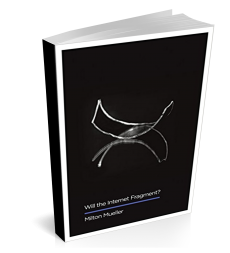 Only an interconnection agreement that would allow access across all platforms would do that – and that would homogenize them and defeat true competition. In the U.S. there is a long history of large enterprises asking for regulation. It started with the railroads. But the most apt historical comparison might be Theodore Vail’s 1907 Annual Report in which the mighty AT&T Corporation, assailed by independent competitors that had wired up 50% of the nation, embraced regulated monopoly as a means of taming and ending competition. As a historical turning point which may contribute to new forms of Internet governance, there is an important similarity between AT&T’s embrace of government regulation and Facebook’s capitulation. “Regulation” could strengthen Facebook’s dominant market position by raising operating costs to levels that smaller companies could not bear. It could lock in common standards for the suppression of forms of speech that are not strictly illegal, thereby eliminating the possibility that new platforms could compete on the basis of more liberal content suppression policies. In another similarity to the old AT&T, as the Wall Street Journal wrote, “Inviting oversight also may dissuade regulators from breaking up a company that depends on its breadth of platforms for continued growth.” To regulate Facebook is to permanently institutionalize Facebook. On the other hand there are important differences. Facebook’s primary concern is not so much “ruinous competition” but an increasingly angry mob of its own users, who feel locked in and hold it responsible, simultaneously, for suppressing too much expression, for not suppressing enough expression, for knowing and revealing too much private information, and for not exploiting private information well enough to detect and prevent harmful forms of expression. In fact, the sheer size of the FB platform has reached the point where the public and politicians are making impossible and contradictory demands on its content moderation processes. Equally important, AT&T’s capitulation took place in a purely domestic context; the new institutions of regulation were at the state and (later) the federal level, whereas Facebook straddles a highly globalized environment spanning dozens of different countries. Calling for regulation inevitably means regulation by national governments, and this inevitably means jurisdictional fragmentation of internet content, applications and services. Zuckerberg’s blog post mostly avoids dealing with the implications of this. True, in privacy and data protection, Facebook correctly calls for globalized standards and rules, but when it comes to content regulation and election protections, his call for regulation would lead to alignment of platforms with national boundaries. We think, oddly enough, that Facebook’s travails underscore the basic wisdom behind the original Section 230 legislation. Section 230 immunizes it from responsibility for posting illegal or harmful speech, but as a private actor, Facebook can exercise all kinds of “editorial discretion” for manually or algorithmically suppressing forms of content that it and its users consider objectionable or harmful. If its gigantic size makes it impossible to keep all of its users happy all of the time, then Facebook and Facebook alone should be saddled with economic responsibility for the way it makes those decisions. The call for government intervention is the media equivalent of the “too big to fail” fallacy. Offloading those responsibilities to governments is not going to make the choices any easier or the outcomes any better, it is just going to take the heat off of the actor who should be feeling the heat: the platform operator. In other words, Facebook and Facebook alone needs to pay the price for its outsized dominance of the social media market. That will impose natural limits on its continued expansion. Of course Zuck’s request for regulation is economically rational, i.e., in FB’s business interests. The fact that Zuck is asking for it, however, does not mean the overall effect of his regulatory proposals are bad or good. We should discuss them on their own merits. You don’t seem to have strong objections against his proposals. So what is the point of this piece? To warn that some people, e.g., Irish MPs, will come up with bad regulatory proposals now that FB is in favor of regulation? I am pretty sure people came up with ridiculous ideas before Zuck’s conversion. Just like there are ridiculous ideas on the side of the people resisting regulation. Is there some strawman that believes all regulation is good? I am sorry you missed the point of the piece. Try reading it again. You say I don’t seem to have strong objections to his proposal? No one else thinks that. Two of his ideas (dealing with content moderation) were portrayed as disastrous and the other two as either hypocritical and untrustworthy (GDPR) or not very meaningful (data portability). And the overall embrace of “regulation” was put in an unflattering historical context. Of course, this blog is not a long disquisition on each of the issues posed, but the essence of my concern is quite clear. Bringing governments into the content moderation process is likely to make it more repressive and less escapable; it will also institutionalize FB’s dominance. We can agree to disagree on “the European view on regulation” but I am talking more about human rights groups and critical analysts of Internet policy that I know of and read about, not about a couple of enlightened ones in TU Delft. Although I know of at least one of your colleagues there who is definitely of the “Facebook is evil and it will all get better if we regulate it” camp. I guess I can’t read then. Twice. I do not see you argument for why content moderation is disastrous. I see a lot of “could”. Strengthen dominant market position. Lock in common standards. Yes. What else? You found no mention of the value of free and unsuppressed expression. OK. This now qualifies as ‘disastrous’? Check. Is the support for GDPR hypocritical? Of course it is. Does that make it a bad idea to see those norms more widely adopted? Even you don’t think so. That data portability was already “taken care of by the market” seems to deny that this was happening partially under regulatory pressure, even before it was codified in the GDPR. So what is the point here? That FB totally self-serving, hypocritical, etc.? Sure. What else? You haven’t brought substantive arguments against the ideas as such. Yes, institutionalizing content moderation will have huge downsides. So does the lack of institutionalizing content moderation. Warning of the downsides is one thing. To those who overestimate the positive effects of regulation, I guess that is a decent point to make. Who is that, though? And what position are you arguing? I honestly can’t tell. A totally libertarian position? The one that Silicon Vally loves to espouse? Every intervention has downsides, as has no intervention. We should be comparing downsides. Calling out the potential downsides of one set of rather vague regulatory proposals is fine, but perhaps I am looking for your ideas on what we should do. Seriously. I want to hear your thinking on this. Perhaps we are in different bubbles. I did not see a lot of excitement over FB’s proposals. OK, so your take on the “European view on regulation” is dominated by human rights activists. Like I said: selection bias. You think human rights activists are a dominant force here or somehow representative of Europe? I guess you haven’t followed the elections in a while. Yes, in general regulation is viewed more favorably than in the U.S. Not because we think it is ‘divine’ and ‘omniscient’ — a strawman the size of Godzilla — but because the alternatives seem worse. So what are the alternatives we should look at? I’m probably asking too much from a blog post. That’s fair. The only reason I was implicitly hoping for something along those lines is that some of your posts actually do achieve more. Which is compliment to your blog.